Do you have an idea already?? Find some help! Talk to the other space hackers and get a team going. Find resources to help bring your idea to life. Know the talents/skills/resources that you already have on your team, as well as those that are missing from your team. There will be others looking to join teams, so be ready to tell them what you need to help bring your idea to fruition. Look around the room and go talk to or listen to the other space hackers and join a team. Don't worry space hackers are a welcoming group and always looking for added members to jam with. Be ready to communicate your skills, talents, and interests, to others, so you can find a good fit with a team that needs what you have to offer! ​Focus on the core part of the challenge or problem you are solving and build that. You can talk about all the ways the idea can expand in the presentation. Divide and Conquer - Use your team members to, research, plan, build and pitch the idea. Everyone on the team can be an asset in different ways and different perspectives can provide solutions that otherwise might not have been considered. 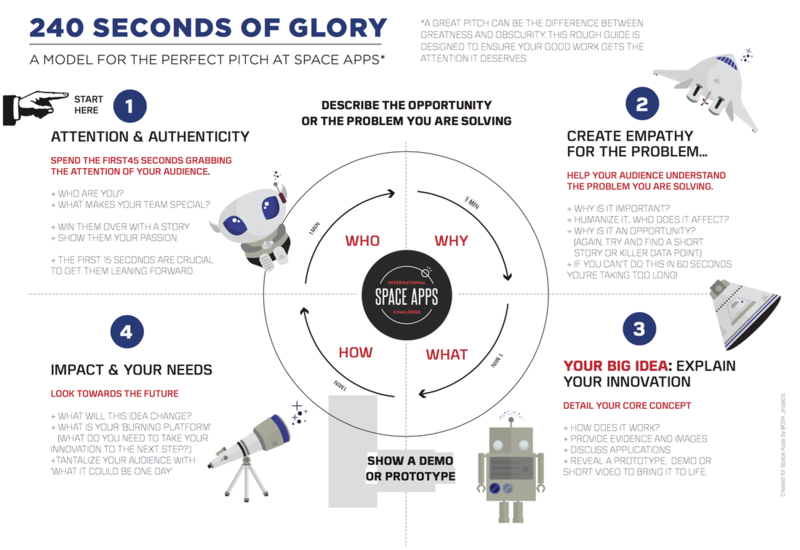 Don't wait to the last minute to focus on how to tell your idea, the story of your idea is a big part of getting it across to the judges and other space hackers. Keen IO - A data analytics and visualization platform that helps Turn Explorers into Discoverers. Heroku - Enables developers to build and run applications entirely in the cloud. OpenKosmos by KubOS - ​An online community for any open source, space-based projects. Climate Corp - To help all the world's farmers sustainably increase their productivity with digital tools.